The last time I rode a ZX-12R, it topped out with a less than hyperbolic 183mph, or 12mph slower than a politically castrated 2000 Hayabusa, leaving in its wake more questions than answers. But let Muzzy loose and the story is rather different. The Oregon firm has been synonymous with Kawasaki horsepower since Rob Muzzy himself signed on as Team Green’s American superbike crew chief 20 years ago. It therefore made sense when Doug Meyer – Muzzys’ second-in-command, resident Bonneville Salt Flat speedster, master technician and chief provocateur of all things quick and fast – ran 192.31mph on a carefully broken-in, off-the-shelf ZX-12R over a 1.16-mile course at Maxton-Laurinburg Airport in Maxton, North Carolina. 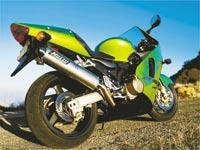 Fitted with a Muzzy’s exhaust system, the same bike then did a claimed 199.1mph. Those figures sounded too good to be true, so that’s when I bravely volunteered to put the bike over 1200 miles or so of undisclosed back roads between Oregon and California, where we would find a suitable place to do a top speed test. Strapped to the unflinching Bartels dyno upon arrival, it put out 161.6bhp and 90.1ftlb of torque, compared to 162.7bhp and 93.7ftlb for the ZX-12R test bike I’d ridden before. This wasn’t exactly what anybody expected. The same bike ripped past the radar gun at 189mph. Fast, but not fast enough to change many opinions. Then the envelope arrived. Inside was a note from Meyer. In it, he outlined the constituent bits in Muzzy’s just-released ZX-12R big-bore kit, which would deliver a quartet of forged 13.5:1 compression pistons fitted to bores 2.4mm larger than the stock 83mm holes. Accompanied by 1mm rings, circlips, an aluminium radiator fan, fasteners, gaskets and other essential bits, the kit bumped displacement from the stock bike’s 1198cc to 1270cc. One call to Muzzy’s and the box was on its way, along with a little how and why to underline a fundamental tenet of Muzzy’s philosophy: Cubic centimetres = speed. Though the ZX-12R engine-ectomy isn’t brain surgery, the 1270cc transformation is best left to professionals unless you’re comfortable with degreeing cams in a new twin-cam, four-cylinder engine. The job takes 10-15 hours of a practised mechanic’s time. With the kit internals and pipe in place, Wymer plugged in a Muzzy-mapped Dynojet Power Commander module, which would tailor the ignition and fuel injection data from the stock black box to match the bike’s dietary requirements. My next job was putting in 500 easy miles to let the new internals get acquainted without harming them, or myself, in the process. Easy enough. Let’s turn the key and see what happens. Binning the heavy stock exhaust for Muzzy’s own aftermarket item sheds 5.9kg (13lb). Aside from the pipe’s baritone exhaust bark and a wavering idle speed that Meyer attributes to an idiosyncrasy of the stock fuel injection, Muzzy’s Godzilla awakens from a night’s sleep like any stock ZX-12R. All other similarities, however, end at 1500rpm. Once past a trivial lean spot at 3200rpm, the 1270cc engine pulls hard enough to detach your retinas from their sockets – and it’s not even broken in. Having survived the first 500 miles, the next order of business is a trip to the dyno to find just how powerful this beast is. With upward of 180 horses on tap between 10,000 and 12,000rpm, it’s all there, with a peak of 182.1bhp at 11,200rpm in between. Torque? How about 101.9ftlb at 7600rpm, with 80ftlb-plus available from 4600rpm up. Those figures sound even more impressive when you compare them with the 182bhp and 108ftlb that was produced by the Hayabusa-based Yoshimura X1 tested by MCN in September 2000. That engine was fortified with well over double what you’d spend on the Muzzy’s kit, including installation. Getting 20 more horsepower and another 8.2ftlb of torque from the already monstrous stock ZX-12R engine was tough enough. Doing it with what amounts to a bolt-on kit is some achievement, though it’s pretty much what you’d expect from Muzzy’s. On the road, this bike is as well-behaved as an off-the-rack ZX-12R. This isn’t a machine designed purely for high-speed runs which is unrideable on real roads. Cracking 150mph on an average motorway sliproad would have been effortless. But because it would have been as potentially lethal as it was blatantly unscientific, we instead adjourned to our top-speed testing venue in the California desert to give Godzilla the whip. With no wind and an ambient temperature in the high 50s, standard gearing pushed the tacho needle deep into the red, turning an indicated 12,200rpm into 195mph on our radar gun. With slightly taller gearing, 200mph would be well within reach. At the strip, we reeled off a 9.69s quarter-mile at 149.8mph, despite the front wheel’s predictably tenuous relationship with the Tarmac. Not bad for a bike you can turn around and ride to work every day.